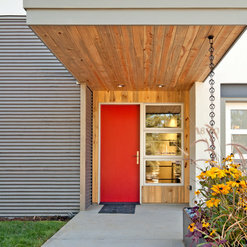 Numerous American Institute of Architects (AIA) Awards including: AIA Architect of the Year, AIA Firm of the Year, and AIA College of Fellows, David Barrett. 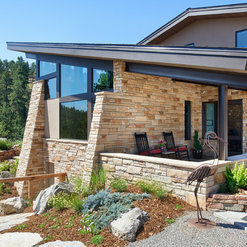 Mountain Living Responsible Development Award, Colorado Homes and Lifestyles Home of the Year, LEED AP, and more. After interacting with two other architectural firms, we chose to work with Barrett Studios. We found that they had a high level of integrity with regards to every aspect of helping us determine the wants and needs for our household and how to make those things happen. Our project was quite a ways from there a base in Boulder but they were able to coordinate very well both with us as well as with our contractor and we came up with a highly successful result. Our personal experience with all the staff of Barrett Studio has been so positive that we think of them now as our friends as well as our architects. 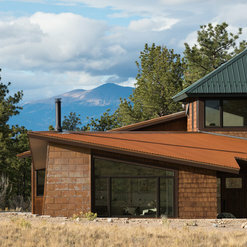 After I bought 70 acres in the rural Colorado foothills, I did NOT want a conventional structure for a home. Because I lived 1800 miles away in Pennsylvania, there were more things that could go wrong due to communications issues. I wanted a small, unique, environmentally efficient house. I did not have a large budget. I considered several architects. I was impressed with Barrett Studios suggestions & thorough consideration of my ideas. They helped with practical suggestions that saved time & money. In my absence, I needed them to interface with the builder. Much of our work was done by phone & email, yet it was thrilling & fun & I learned so much. The exterior design has surprising sizzle & the interior is so smart. I chose to re-think my budget & expand the plan from my initial thinking, because they were persuasive & right to encourage those changes. Living here is much better because of those ideas. We've been coming here for 10 years now & get great joy from this very different environment. One son insisted "NEVER sell this house", though we haven't considered selling. The experience here is so different from others in our world. Working with Barrett Studios redefined what our project became in so many positive ways. David is a brilliant artist, and Rich and the craftspeople they worked with cared so much about beauty and the place. I felt like these are some of the coolest guys I ever met. When we moved in, it felt like a lot of love had been put into this project, and the beauty resulting from a collaboration of so many is something really special about the house. At first we were having trouble believing we get to live in a house this beautiful. Now we are simply grateful on a daily basis. We are completely inspired by the simple beauty of your home. It wasn't a surprise to us when Colorado Homes & Lifestyles magazine wanted to feature it in their "before and after" issue. What a remarkable transformation. 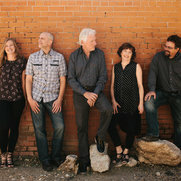 We are lucky enough to have co-created our living space with David Barrett and his team at Barrett Studio Architects. 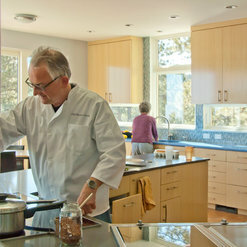 We set out with very ambitious goals for our property to support us in many ways: creatively and professionally with 2 working studios (ceramic art and movement); culinarily - with multiple all-season food growing areas, built-in irrigation throughout, a worm composting system and a professional and ergonomic kitchen; health and wellness - with pool, spa and indoor and outdoor meditation spaces; green building - with 10KW of solar panels, efficient geothermal exchange heating and cooling (very important with regard to the pool! ); esthetically - we defined our space as an “Art House” because people need beauty to thrive, like plants need sunshine; and last but not least, to support a thriving lifestyle that engages with our beautiful surroundings and permits us to experience the joy of inhabiting an integrated, highly-considered and functional “engine for living”. 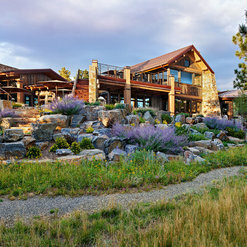 We believe David and his team heard us and exceeded our expectations in the design of our mountain paradise. Thank you, David. Architects are only in the most base sense in the business of creating buildings; they are more essentially in the profession of co-creating manifestations of intention and personality – places in which we feel at home, at peace, and understood. I can say without qualification that Barrett Studio accomplished that in our project on a grand scale. I feel as if our house is not only an expression of my and my wife's person and personality, but an amplification – I feel more myself in our home than I thought possible, and the best parts of myself, the best parts of my mind and heart, find expression there. David and Nicole did this by listening in the deepest sense to who we were, not what we thought we wanted. They were not distracted by the mundane detail of engineering and caissons and soil tests, although they handled all of those details with ease. They understood us, and they helped us understand ourselves as we created with them. In any craft, this is possible only in the hands of a true master – someone who has learned enough through experience to know how to guide others as they learn themselves. Since 1988 the partners at Harrington Stanko Construction have completed over 25 projects working with the Architects at Barrett Studio. The creativity and professionalism of David, Sam and the whole staff remain unsurpassed. Barrett Studio does not just create innovative architectural forms; they also work effectively with engineers, contractors and craftsman to implement those designs in the most proficient and cost effective manner possible. 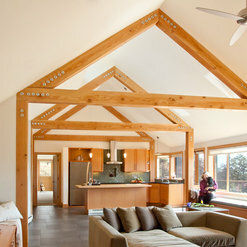 Barrett Studios is a progressive architecture firm that designs thoughtful, sustainable homes (among other things). We've worked with them extensively, and they're always a pleasure to work with. Their attention to detail and knowledge of sustainable design (beyond just energy efficiency) is both rare and refreshing. 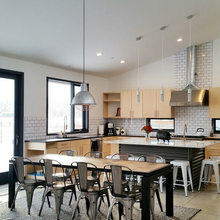 My husband and I had the pleasure of working with David and Sam on our dream home. We Couldn't be more pleased with the finished product. 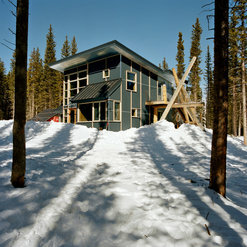 The design was a perfect blend of contemporary lines with a Colorado Mountain feel. They did a wonderful job and we would use them again! Great experience! From the moment David stepped into our home, the remodel ideas started to formulate. Working with us on the feel we wanted to create, he came up with design concepts that met all our needs. The staff worked closely with us along the way, considered our ideas and executed beautifully. We came in on time and on budget. David and Sam did such a wonderful job on my house! I fell in love with my lot and wanted a house that would be respectful of the site and allow me to celebrate its beauty while living there. David and Sam embodied this ethos even more than me. At conception, they came out and camped on the lot to get a feel for siting and placement of the house. Their preliminary models and drawing were done there with me in the middle of the trees next to the river, which allowed for all of us to get a clear sense for what the house would be like and also to feel in harmony with the setting. 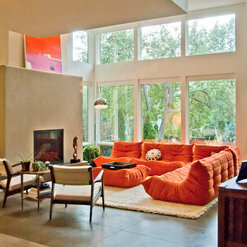 Later, their design showed such attention to detail, interplay of light and shadow inside the home, and livability. As a first-time house builder, they walked me through all of my options to control costs and yet get the house that I love, giving sound advice to both me and my builder every step of the way. Now that we're finished and I've lived here for almost 2 years, I can't imagine building another house, because mine is perfect (!) but if I do I will definitely turn to them again! Thanks so much! Matt brought his own passion to the table, which makes the co-creative process so much more powerful. First, Matt truly loves the land and made clear that he really wanted to make sure the construction of a house in this location would respect it's natural character. Building in the grove of trees along the river required we surgically insert the structure, rather than impose it by force. Matt also brought rich memories of his experiences of living and working as a physician in Africa. Imagery of lifting a boardwalk above the riverfront landscape allowed us to send a message of touching down lightly as one approaches Matt's home. 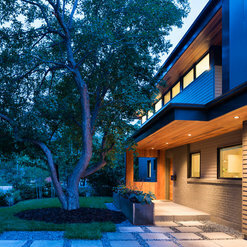 We like to approach our work through the lens of what might be considered, " gentle architecture". Matt is a gentle soul who would have it no other way. We'd like to clone him as a client and friend! David, Nicole and team designed a wonderful home for us in Florida. A long distance project can be a challenge but they made it work. Five years after moving in we are still in love with our home. Thanks so much for the review! It was a blast creating a special place with you that respects the site - those trees! - and the wet & wild Florida climate. This company worked with some friends of mine to build their house and I have never seen such a thoughtful and creative design. I have consulted with them on my own house building and will be using them in the near future based on these amazing first impressions. So far, within our discussions, I feel they really listen to what their customer wants and are able to translate that into more beauty and functionality than you imagined. Dear da123nce - Thanks so much for your review! It's always a treat to hear an outsider's perspective of experiencing the spaces we design. I (finally!) figured out that I could comment on your review as a way of potentially contacting you. It looks like you've been busy creating some intriguing Ideabooks around concepts you like for your new home. Please feel free to reach out to us when you're ready to talk about starting the design process! Commented: Gorgeous designThank you so much! We love it too. Commented: floorsThey were poured new...this was a new custom home. Commented: what are the dimensions of this apartment/buildingThe home dimensions are approximately 24' x 20'. The deck dimensions are approximately 22' x 22'. Hope that helps! Commented: CabinetrySorry, we are not sure about the cabinetry materials! Commented: Can you tell me where you found the rug?Sorry, we don't know, the owners bought it!